New Society Publishers, 9780865716063, 176pp. The title of this book is "Reinventing Collapse," and I haveto say that's exactly what this book manages to do. It's a short book, so you could reqad it in just a few hours, but it is packed with information and "make you think" moments. Orlov's unique perpsective on American life engages the reader and opens your eyes to what life in America is like to an outsider. Without a doubt the most useful aspect of this book are the details of what the situation was like in Russia after their political collapse. This book is a tutorial on how the reader might modify thier life in the future if (or when) America collapses. Reviewed by Matt Mayer - "Groovy Green"
In the waning days of the American empire, we find ourselves mired in political crisis, with our foreign policy coming under sharp criticism and our economy in steep decline. These trends mirror the experience of the Soviet Union in the early 1980s. 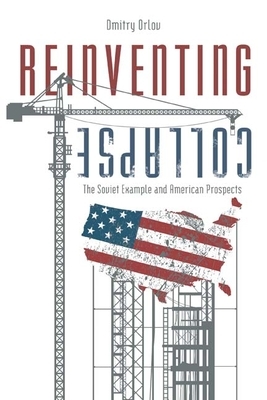 Reinventing Collapse examines the circumstances of the demise of the Soviet superpower and offers clear insights into how we might prepare for coming events. He argues that by examining maladaptive parts of our common cultural baggage, we can survive, thrive, and discover more meaningful and fulfilling lives, in spite of steadily deteriorating circumstances. This challenging yet inspiring work is a must-read for anyone concerned about energy, geopolitics, international relations, and life in a post-Peak Oil world. Dmitry Orlov was born in Leningrad and immigrated to the United States at the age of twelve. He was an eyewitness to the Soviet collapse over several extended visits to his Russian homeland between the late eighties and mid-nineties. He is an engineer and a leading Peak Oil theorist whose writing is featured on such sites as www.lifeaftertheoilcrash.net and www.powerswitch.org.uk. Dmitry Orlov was born in Leningrad and immigrated to the United States at the age of 12. He was an eyewitness to the Soviet collapse over several extended visits to his Russian homeland between the late eighties and mid-nineties. He is an engineer with a BS in Computer Engineering and an MA in Applied Linguistics.